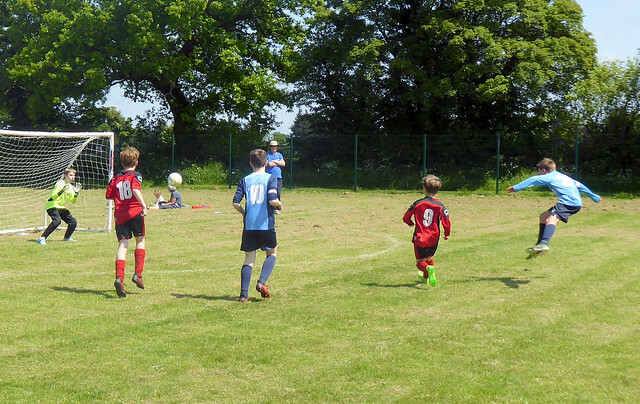 Over 200 players from 37 different teams enjoyed an exciting and sunny five-a-side tournament organised by the youth section of the Norfolk Christian Football league on Saturday (May 19) at Old Catton, Norwich. The now annual tournament took place at Lavare Park in Old Catton, with teams competing at Under 10, 12, 14 and 16 levels, representing clubs from across the county including: Wymondham, Norwich, Hethersett, Sheringham, Old Catton, Stoke Holy Cross, Brooke, Costessey, Thorpe, Surlingham, Happisburgh and Lowestoft. During the morning, the Under 10s final saw Easton St Peter beat Old Catton Blues 3-0 and in the Under 12s Stoke A beat Costessey Jets 5-0. In the afternoon session, league champions Happisburgh beat Old Catton Soul 1-0 in the Under 14 final. In the Under 16 final league champions Lighthouse, from Sheringham, saw two of its teams compete with the B team beating the A team 2-1. To see a full picture gallery of the tournament, see above or click here.